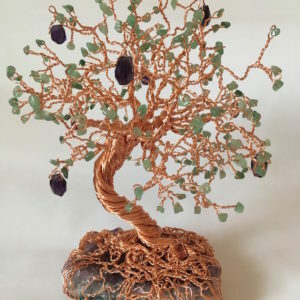 This copper and amethyst tree sculpture is 30cm tall and 30cm at it’s widest point. It is constructed from 110 meters of copper wire. 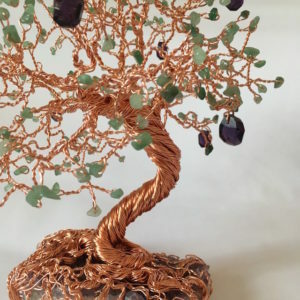 Its fruits are made from 8 high quality faceted amethyst drops, while the leaves comprise 63 aventurine chips and it is mounted on a 17cm by 11cm by 5cm amethyst bed. 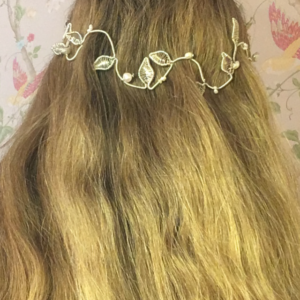 This delicate wedding wire hair accessory crown has a circumference of 60cm, which is adjustable. 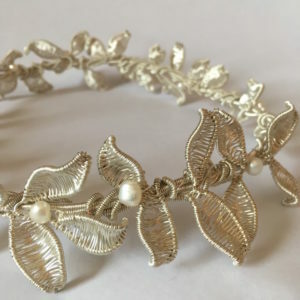 It’s design uses 26 full wire woven leaves and 46 fresh water pearls (ranging from 3 to 8mm in length) to achieve its light and fragile appearance, weighing just 51g . 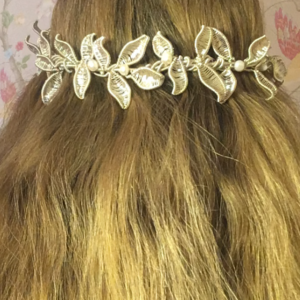 The leaves are 2.2 cms in length and are made of silver plated copper on a wavy crown base. It is 5.5cms wide and uses 35 meters of silver plated copper wire. 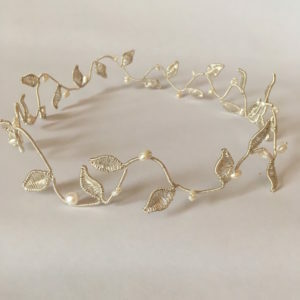 The unique and graceful design of this wire necklace uses 3 ivory coloured rounded blooms, one of which is in a half open position each with silver spiral centres There are 11 leaves including one which is used to cleverly disguise the clasp. The flowers are between 2.5 and 4cms in diameter and the leaves are 2.5-3cms long. The necklace is 18 inches long and 7cms at it’s widest point. It weighs 64g and uses 31 meters of coloured enamelled wire. 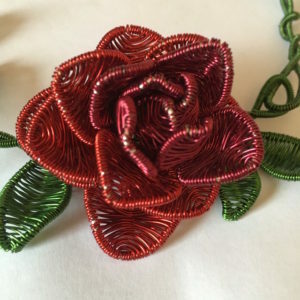 This beautiful wire woven necklace is inspired by our most romantic flower, the rose. The formation of the two tone red rose requires 17 petals. 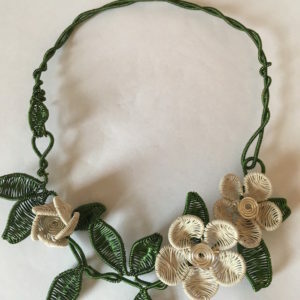 This is complemented by twelve fully wire woven leaves set on a climbing vine necklace. The clasp is also cleverly disguised as a leaf. The rose is 5.5cms across and 3cms deep, while the leaves are 3 to 4 cms. The necklaces is 22 inches and is made of 34 meters of enamelled copper wire, and weighs 78g. 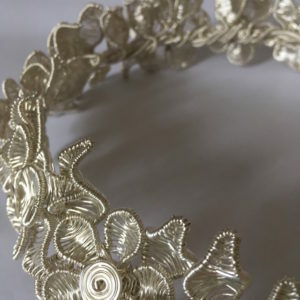 The attractive and unique design of this wedding hair accessory bun circlet uses 3 flowers in ivory wire with silver spiral centres ranging from 3.5-4cms. 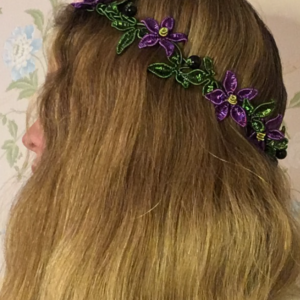 It has 13 fully wire woven leaves and a loop at either end so that it can be secured to your hair using bobby pins. It has taken 32 meters of wire to produce this piece. It weighs 52g and is 6cm wide. 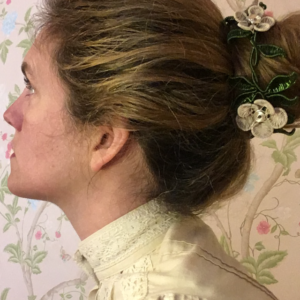 This very distinctive and unusual wedding wire hair accessory is very adaptable and can be used to decorate to many hair styles including French pleats. 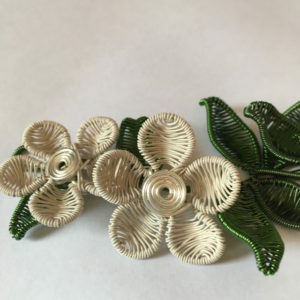 The design uses 3 rounded flowers in ivory with silver spiral centres ranging from 4 to 4.5 cms in diameter and 9 leaves ranging from 2.5-3.5 cms in length. It has taken 29 meters of wire to hand make this piece, which weighs 46g and is 6cm wide. 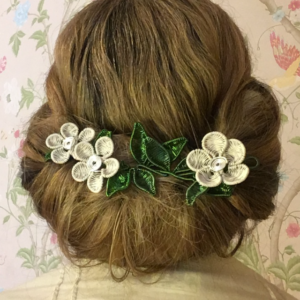 The design incorporates a loop at each end, which makes it easy to fix into your hair using bobby pins. 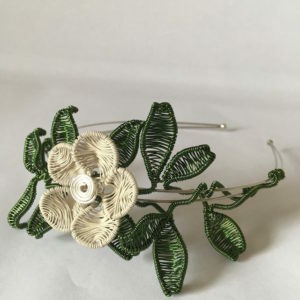 This lovely wedding hair accessory has one ivory rounded wire flower with a silver spiral centre and 11 petals. 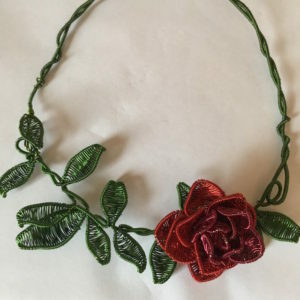 It is attached to a two strand wire headband and sits over to the side of the head to form an elegant adornment. The flower is 4.5cms across and each leaf is 3-4cms long. There are 18 meters of enamelled copper wire in this piece and it weighs 44g with a width of 7.5cms. 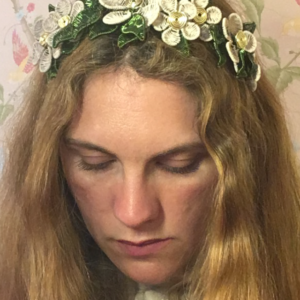 This gorgeous wedding hair accessory tiara has been woven using 93 meters of enamelled copper wire. It’s design includes 7 flowers ranging from 3.5 to 5cm. Each flower has ivory petals and champagne spiral centres. There are 27 leaves in leaf green wire ranging from 2.5to 4.5cms. 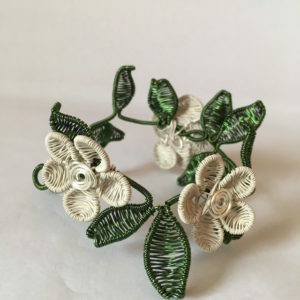 The woven pieces have been attached to a two strand silver coloured wire headband and is 6.5cm wide. It weighs 137g and has been tested for to ensure that it is comfortable to wear for the whole day. This highly distinctive and beautiful tiara will complement many styles of wedding dress. Will it be yours? 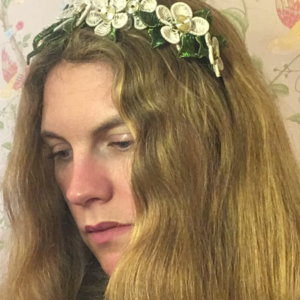 This charming wedding hair accessory crown takes its inspiration from the voluptuous and mysterious beauty of the deadly nightshade. The purple star shaped flowers, contrasting yellow stamen, characteristic three grouped leaves and dark berries. 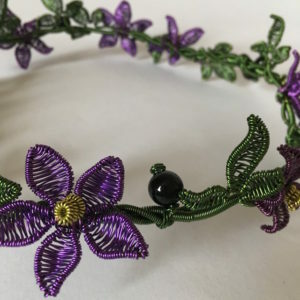 The crown’s design includes 9 deadly nightshade flowers, 7 berries and 12 groups of 3 leaves. The glossy berries are made from highly polished 10mm black onyx beads. It comprises 87 meters of enamelled copper wire. Free the goddess within. 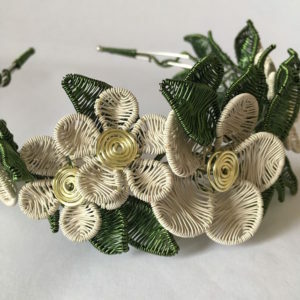 This beautiful wedding hair accessory has been sensitively woven to produce a stunning piece of art jewellery that will make you feel like a queen on your special day. Each piece is hand crafted in Somerset to the highest quality to be as lovely and unique as you are. 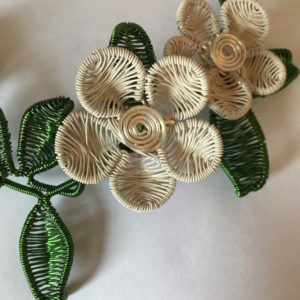 This beautiful wedding hair accessory has been sensitively woven to produce a stunning piece of art jewellery that will make you feel like a queen on your special day. Each piece is hand crafted in Somerset to the highest quality to be as lovely and unique as you are. This wedding hair accessory crown’s ravishing design includes 12 flowers ranging from 4cm to 5cm in diameter. 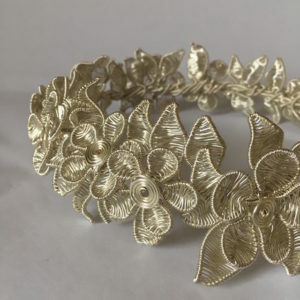 It has 55 fully wire woven leaves attached to a handmade silver plated wire wrapped crown base. This crown has a reassuringly regal weight. This is testament to its quality; however it remains very comfortable to wear.